Infos Art s.r.o. company is the biggest producer of kiosk terminals with touchscreen technology in the Czech Republic since the year 1995. And also a distributor of touchscreen sensors by EloTouch company. Our biggest customer is state administration, especially Ministry of Labour and Social Affairs which received approx. 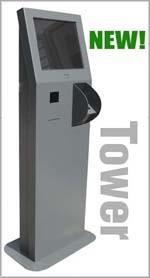 400 units of kiosks from us. 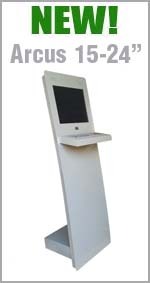 Kiosks are exported to Austria, Denmark, Sweden, Norway, Finland, Poland, Germany, Greece, Spain, Russia, Slovenia and Slovakia. (section "Kiosk Terminals"). 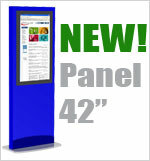 Every kiosk is prepared for standard PC, LCD display or monitor with touchscreen and speakers. Then there are other optional peripherals such as Smart Card / Chip Card readers, thermoprinters, coin acceptors, cameras, security device, etc. 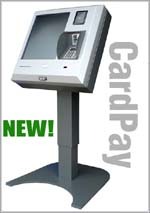 For reliable operation of the kiosk we recommend Win2000 Pro or Win XP Pro software. For browsing Intranet and Internet we recommend secure kiosk browser with virtual keyboard called WebTouch (you can download fully operating 30-day trial version) or a version for Linux based on Mozilla called PowerTouch. Because all kiosk terminals presented in our portfolio are developed and manufactured solely by us, it is possible for us to make custom-made kiosks according to wishes and needs of each individual customer. Kiosk terminals are developed for all environments, “vandalism proof”, with different finishing, eg. komaxit, autolack, stainless steel ( optional colour of the finishing for free).